...high-capacity USB hard drive attracted a comment or three on the desirability, or otherwise, of larger-than-3.5-inch hard drives in the modern world. 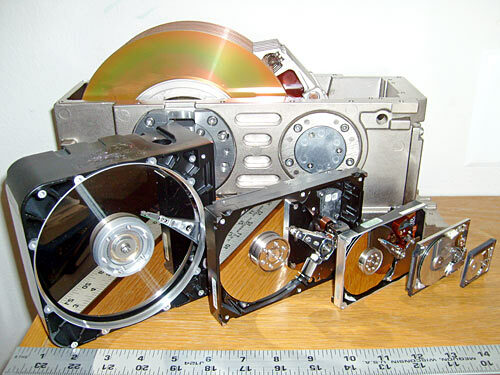 This picture is of six sizes of disk drive, from a one-inch microdrive to an old eight-inch monster, only one evolutionary step on from the disk packs of Sixties prehistory. 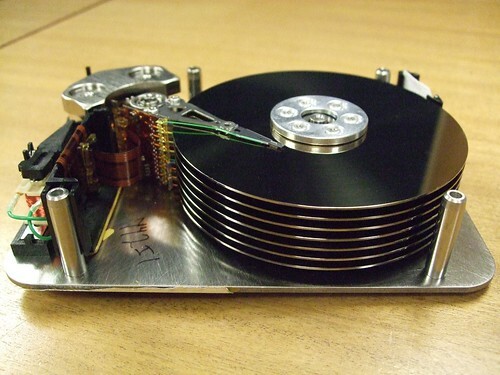 The fastest spinning-disk drives today are 10,000 and 15,000 RPM 2.5-inch units. Western Digital's VelociRaptor line, essentially high-reliability server drives sold in the consumer market, remain a good compromise between performance, reliability and capacity. They're not as fast, especially in the latency department, as an SSD, but they're at least as reliable and have higher capacity, and much higher capacity per dollar. I, too, would be happy to buy an outrageously high-capacity large-plattered drive with modern data density, even if its latency was awful. The whole drive production chain, though, is currently geared for 3.5-inch and smaller platters, and the fantastically small tolerances in modern drives might have problems with larger platters. Platter and head-arm droop caused by gravity might be an issue. Still, just imagine an eight-inch drive with the same data density as the drive inside the Seagate Expansion box. That is, I presume, a "3Tb" Seagate Barracuda, with three platters and six heads (PDF datasheet). The spindle holes in the middle of larger platters tend to be bigger in proportion than the holes in smaller platters, but back-of-an-envelope calculations still suggest an easy formatted capacity of five terabytes for a 5.25-inch drive, and ten terabytes for an eight-incher, with the same platter and head count. And that's even before you start raising the platter count. ...and the sky's the limit! Part of the issue with large-geometry drives is "what's the application?" Obviously you can't stick an 8" drive in a laptop (although it would be amusing to see such a beast), and there aren't that many people who *need* such capacity in a desktop. There are a few, to be sure, but probably not enough to justify the manufacturing. I can imagine more application on the server side of the industry, though--large archives of rarely-used data, like an archive.org. But there doesn't seem to be too many of that type of site. It'd be awesome, though, to have an 8" hard drive, preferably external, with a transparent case, to set on the desk, so I can watch the heads fly back and forth. An 8" doesn't fit too well in today's machines, but I can't look across a classroom or office without seeing PCs that have room for another 5.25" drive or two. I'd take four and make a RAID6 for paranoia's sake. Redundancy works out to about a ~$0.05/GB premium on your overall capacity, assuming you pay an outrageous* ~$0.12/GB for capacity. *I call this outrageous as it's the approximate cost of my data dump disks about two and a half years ago, on sale. so I can watch the heads fly back and forth. Precisely. It's impossible to make a practical case for a modern large-platter drive versus today's super-cheap economies-of-scale 3.5-inchers, but I'd still love to have one! We're now in the twilight of the moving-parts drive. Perhaps, decades from now, people will still make them, for the same reason why people still make fancy clockwork wristwatches today :-). I don't think we can still call it twilight. Late afternoon, perhaps; it'll be a few more years before we can rid ourselves of spinning platters, as SSDs are unlikely to reach the price-per-gig ratio of HDs in less than, oh, three or four years, at a completely wild guess. As for who'd buy slow five-inchers: anyone with a need for storage of lots of data. Which, in these days of fast broadband and rampant media sharing, translates to "practically everybody". 3.5" 7200rpm 500GB system drive (or superfast SSD if you're rich), 5.25" 5-terabyte storage drive. What's not to like in this setup? Eight-inchers might be pushing it, because you'd essentially need a new case design to fit them. 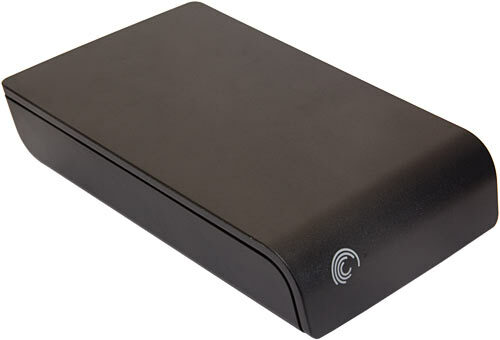 Even then you could always have external disks with their own enclosures; anyone who is happy with a full tower PC case is unlikely to raise their eyebrows too high at a further similarly sized storage device if it gives them 10 or more terabytes of space - even if you'd realistically need two for safety. A bigger issue is, I think, lifespan. The smaller a drive gets the less sensitive it is to shock. This is why I pictured a full-tower case for an eight-incher: the drive itself might not be much bigger than an old A4 scanner, but you'd probably need to elastically suspend it in the middle of a rather larger enclosure to prevent the smallest shock sending all your data to hell. A modern super-data-density five-incher would probably do fine with just some sort of padded enclosure, though. So I still want someone to start making them. Yet. Yet. "I don't think we can yet call it twilight". Dan, do you plan on ever adding a comment editing feature to this blog? To extend that a bit, I had 4x750 in a RAID-Z array (think RAID-5 but better) in the fileserver. That'll never fill up! Oops.. scraped by for a while until I put in 4x1.5Gig drives, there! that'll never fill up now! Oops again. looking at 6TB of online storage on the fileserver (2TB array, 4TB array) with about 1TB free. yeah.. one can never have enough storage. would love for a few cheap 5.25" high capacity drives, even if the seek is abysmal. Most of the stuff I do there isn't seek dependent as it's just storage. Eventually I'll start using larger drives, but I have to replace my parity drive with a larger drive. But, I can still "demote" the parity drive to regular data after I replace it, it just means my next drive addition, no matter how large the drive actually is, will still only gain me 1.5TB of storage. Yeah, I looked at UnRAID but I also wanted a general purpose machine and well, data integrity was more important to me than a bit of annoyance so ZFS and RAID-Z it is for me. I upgrade infrequently enough (lack of fundage something fierce) that it hasn't been an issue. Just make a new array and move the data around. Though BTRFS is looking like a better alternative after Oracle screwed things up with ZFSonlinux by discontinuing OpenSolaris. Doesn't have RAID-5 yet but supposed to be happening soon-ish.